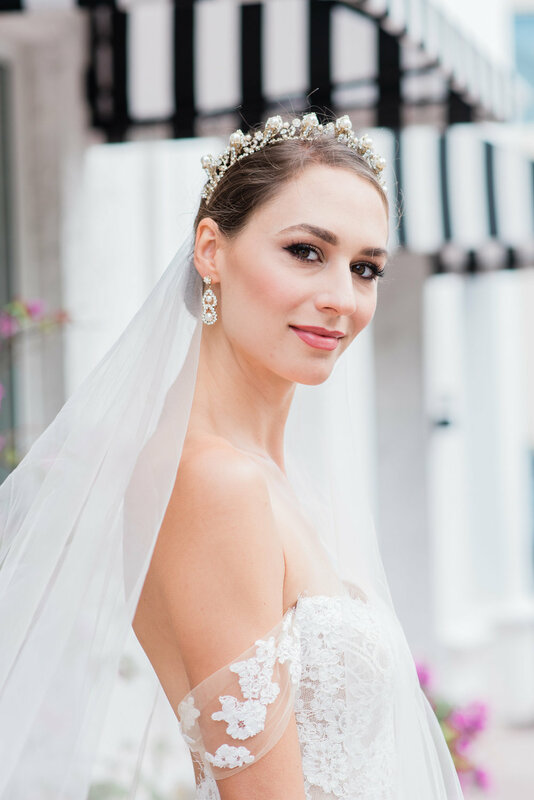 We're honored to play a part in such an important time in each bride's life, that's why we ensure that every bride's experience is chic from start to finish. Shop trunk shows for access to the latest designer gowns, fresh off the runway, before the full collection is available in store. Our team visits New York twice a year to shop the runways at New York Bridal Market, the bridal industry's Fashion Week. We meet with designers to see the collection up close and then say au revoir, for now, and wait until the full collection comes to visit us in our Coral Gables boutique. You'll be the first to shop the collection. We often offer incentives and perks for purchasing a dress from a trunk show. Designers often come by to say hello and work with our brides on their perfect wedding day look. Recent guests include Berta, Lazaro, Ines Di Santo, Hayley Paige and more. Click here for our upcoming trunk show schedule. The majority of our stock gowns are size runway sized, but they're just samples for you to see and try on as you shop. All gowns are custom ordered, to your measurements from our selection of chic designers. We carry a small selection of gowns in size 14, 16 and 18. Every guest at Chic Parisien works with a dedicated stylist to guide you through the process of finding the perfect wedding dress. Your one hour appointment takes place in a private fitting room. Your first two private shopping appointment are complimentary. We require a $100 deposit for a third visit. To celebrate our 49th year in business, we've launched a VIP menu of special add-ons to upgrade your experience. We'll have macarons, champagne, mini rosé bottles and more waiting for you at your next appointment or fitting - plus, you can purchase additional time whether you're visiting to "say yes to the dress" with your closest family and friends or finishing your final alterations. Click here to request a VIP appointment. When you visit Chic Parisien, you're shopping a selection of our favorite gowns from our designers. We can request, with a deposit, additional pieces from past or present collections. Most designers allow for changes and customization so that the dress can be the perfect reflection of your personal style and their design expertise. Once you've found your gown, our seamstresses will take your measurements to be submitted to the designer and your dress will be custom made.